Personalize any tablet with custom skins made by you. Have a special photo or authentic artwork that your designed? Upload any image and create your own custom iPad skin using the iPad skin customizer. Choose your iPad model and start customizing now. Extend your unique personality onto any Microsoft Surface tablet with custom made tablet skins. 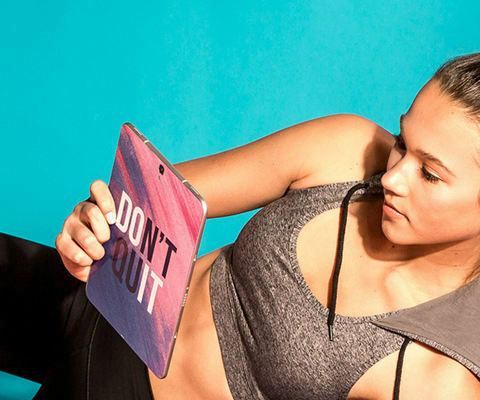 Upload any image that inspires you and design your own Surface tablet Skin today. Select your Surface model and get started. Put your passion directly onto your Google tablet with custom made decal skins from Skinit. Upload an image that inspires you and design your own Google tablet skin today online at Skinit. Showcase your creativity and express your personal look by creating a custom tablet skin for any Amazon Kindle tablet. Choose your Kindle model and create your own tablet skin online.